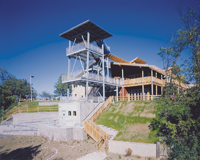 What makes the Urban Ecology Center deserving of a Mayor’s 2004 Urban Design Award? Well, a lot of things. The Award recognizes efforts “above and beyond to create public spaces or street friendly buildings that are warm, welcoming, innovative, creative, urban, sophisticated and fun,” and a visitor to the Center will see all of that and more. Driving down Park Avenue for the first time, one just has to wonder, “What is that?” The building’s attractive face combines recycled brick, galvanized steel, and cedar strips. The tipi on top? That’s where Dave Granados, member of the Tigua-Pueblo Yeslata Del Sur tribe, gathers students, scouts and adults around a fire and tells stories. The main lobby invites visitors to curl up on a willow tree couch by the fire and read or study. Saturdays at 1 pm in the animal room, snakes, turtles, salamanders and fish are fed. If you’re really lucky, John, Richard or Patrick will let you hold a snake. Upstairs a secret revolving door reveals a conference room, more willow furniture, an old-fashioned slate chalkboard (better for the environment) and a children’s library. Milwaukee artist Kitty Dyble Thompson’s nature murals of historic Riverside Park serve as window shades. After your conference try riding the Center’s waterfall — a wavy, blue slide through more nature murals amid sounds of rushing water. “Our whole intent here from beginning to end has been how we can best serve the kids we’re working with,” says Executive Director Ken Leinbach. “We’re trying to serve our neighborhood well.” Forty schools within a radius of two miles make up their neighborhood. “When we work with a school, we contract for a year, and we become their outdoor laboratory for that year. We renew those contracts year after year,” says Leinbach. In addition to mentoring future nature lovers, the Center provides many benefits for its members including a bi-monthly newsletter and calendar, loan of the Center’s equipment (extension ladder, canoe, tools), notification of spectacular outdoor events, discounted program fees. “We’re a good neighbor,” Leinbach says. “It’s a part of our mission.” All this for $25 a year. How about a Good Neighbor Award? 1500 East Park Pl., (414) 964-8505; www.UrbanEcologyCenter.org; Mon. -Thu. 9 am-7 pm; Fri. & Sat. 9 am-5 pm; Sun. noon-5 pm.